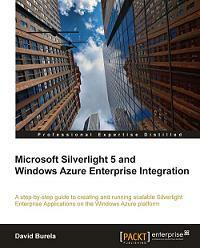 Packt brings to you Microsoft Silverlight 5 and Windows Azure Enterprise Integration, a new book and e-book for developers which shows how to build and run Silverlight Enterprise Applications on Windows Azure. Written by a senior .Net consultant, David Burela, this book contains various tips and tricks required to create scalable enterprise Silverlight applications that run on the Windows Azure platform. Integrating Silverlight and Windows Azure is always tough without proper guidance, and this book provides a step by step tutorial that displays how to attain the required tool-set in order to create and run Silverlight Enterprise Applications on Azure. Developers will be familiarized with steps required to set up an Azure development environment and delve further into complex features such as hosting Silverlight applications in Azure, using Azure Queues in Silverlight, manipulating data with RIA services and many more. Silverlight is a free plugin and a powerful development tool for creating rich media applications and providing an interactive user experiences for Web and mobile applications. Windows Azure is a cloud services operating system that serves as the development, service hosting and service management environment for the Windows Azure platform. Silverlight allows an integration with Windows Azure in order to create and run Silverlight Enterprise Applications on Windows Azure. After reading the Microsoft Silverlight 5 and Windows Azure Enterprise Integration book, developers will learn the basics that make up the Azure platform and understand Azure storage. It will help them improve the development of business applications using various frameworks like WCF RIA Services. It also covers essential topics enabling readers to partition a relational database into shards in order to improve scalability and performance. All Microsoft Silverlight books and ebooks are published by Packt Enterprise. Packt Enterprise is a publishing division of Packt Publishing designed to serve the information needs of IT Professionals in the Enterprise space. Packt Enterprise publishes on Microsoft, IBM, Oracle, Citrix, Java, Amazon, Google and SAP technologies.